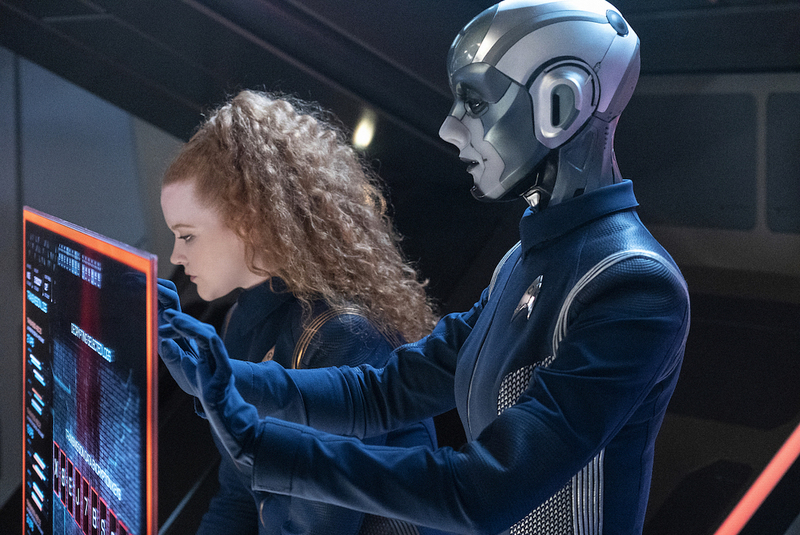 One difference between Star Trek: Discovery and its predecessors is its focus on a small core of characters, with much of the Bridge crew being glorified extras with limited dialogue. It’s debatable if this has been a strength or a weakness, but it does mean some now-familiar faces are difficult to name and don’t do much beyond follow orders and fill out an away team. Strangely, “Project Daedalus” marked our first real look at Lt. Cdr. Airiam (Hannah Cheesman), the cybernetic woman who’s felt more like a visual garnish than a three-dimensional character. This episode gave her some dimensions, thankfully, however belatedly, and considering it was one of the most emotionally impactful hours of the show… can we do the same for the other background characters, please? 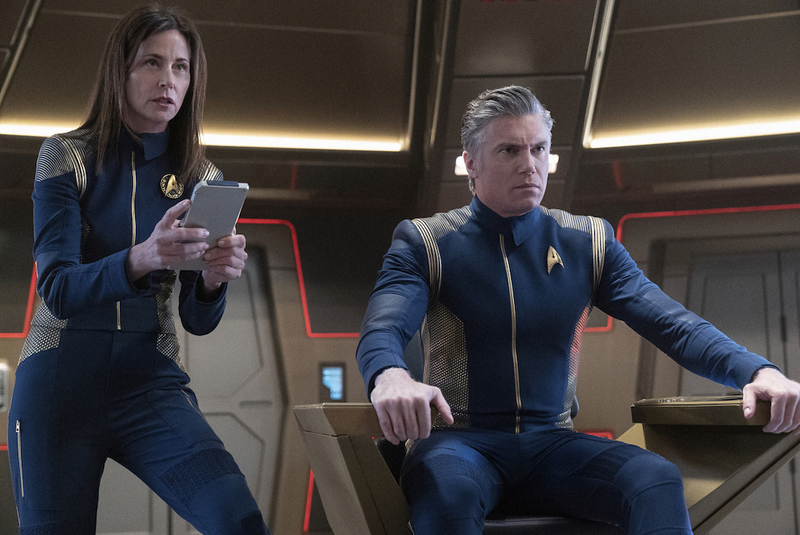 Now considered fugitives by Starfleet, the USS Discovery picks up a sympathetic Admiral Cornwell (Jayne Brook) and they start to try and unpick the situation facing them. She has video evidence that Spock (Ethan Peck) murdered three people while escaping a Starbase, but Spock himself has no memory of this and Michael (Sonequa Martin-Green) attempts to help him understand why the Red Angel chose him to receive its vision of a future annihilation by an unknown enemy. There were some very charged scenes between Spock and Michael this week, as their difficult relationship was put on display for the first time. Peck did a much better job than last week playing the character, even if Discovery’s take on Spock is a lot more emotional and less stoic than Leonard Nimoy played him originally. Maybe the writers are just bored of trying to make Vulcans interesting but unflappable, so they’ve decided to embrace the fact Spock is half-human and play up that side of him more. Whatever the decision, and whether or not you agree with it, the scene where Michael attempts to focus her brother’s mind my playing three-dimensional chess was nicely done, and well-shot by director Jonathan Frakes (who played Riker on The Next Generation, for those unaware). Indeed, “Project Daedalus” was a very well-made episode and there were a lot of opportunities for Frakes to flex some directorial muscle. 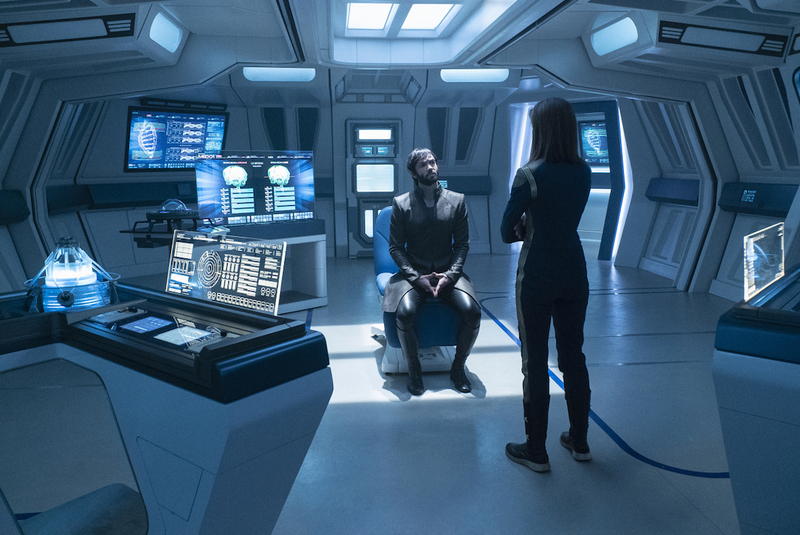 I particularly enjoyed the sequence where Discovery arrives at Control, a disused penal colony Section 31 secretly use as their headquarters, only to find themselves in the middle of a minefield. The devices are outlawed by Starfleet, but Pike (Anson Mount) had to guide the ship through the danger with the help of Cornwell, with their shields down, as various types of mine caused mayhem: ones those latch onto the hull and attempt to saw their way through, others that cause a “blackout” of the sensors so they have to fly blind. The crux of this episode concerned Airiam, however, whom we know has been infected by a computer virus. The episode had a difficult job on its hands, as we barely know Airiam as a character, but it managed things magnificently considering the balancing act required. It helped just to know that she was once a beautiful young woman in love before a terrible accident, resulting in her augmentation. 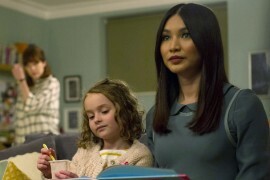 I’d previously assumed she is an android—causing some issues with the timeline, as this show is set decades before Data on The Next Generation was created—so it was nice to get some clarification. 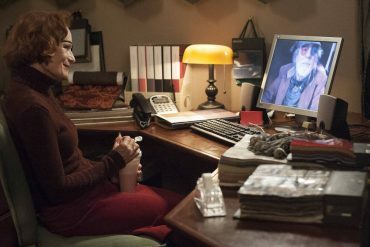 There’s a lot that could be done with a character who looks and sounds so artificial, who is kept alive through technology that’s saved her life but at a cost that involves a finite memory – so she has to delete unwanted memories each week. It’s a shame the character’s moment in the spotlight, where it seemed like the show was promoting her to someone we’ll be spending more time with now… ended up being her swansong. To cut a long story short, it turns out that Airiam was being controlled by someone at Control, who has killed the Section 31 personnel there and tricked them with holograms into thinking that Spock is a murderer. 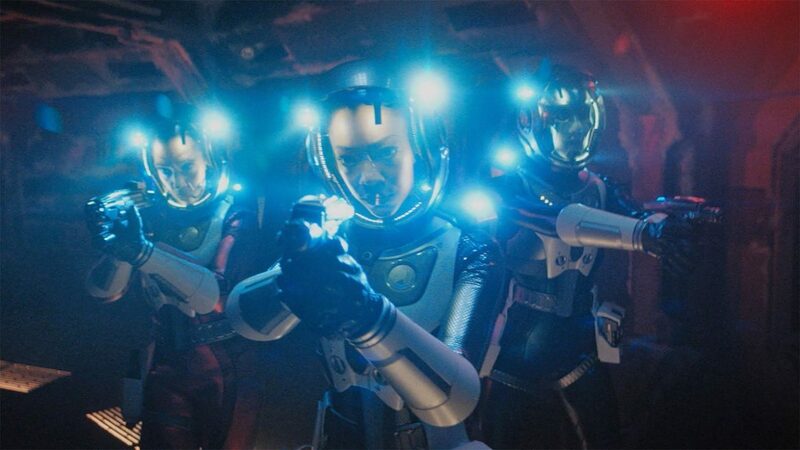 Airiam has been used to bring Discovery closer, so her puppetmaster can download the lifetimes of knowledge the crew found inside the Galactic Sphere they encountered in “An Obol for Charon“. Specifically, knowledge about artificial intelligence, so it can evolve (suggesting it’s also A.I) and eventually destroy all biological life in the galaxy—as seen in the Red Angel vision Spock had. Presumably, the Red Angel is this A.I’s adversary in the future and is using time travel to nudge Spock/Michael/Discovery into defeating the A.I before it can succeed in its mission? The climax of “Project Daedalus” was unexpectedly moving, as Airiam’s cover was blown and she began fighting Michael and Nhan (Rachael Ancheril) at Control while trying to finish downloading the Sphere’s information. There was a brutal fight that really landed its punches thanks to some well-staged moments and good sound design, and things got very emotional once Tilly (Mary Wiseman) managed to break through to Airiam by reminding her of their friendship before it became clear the only solution is to blast Airiam out of an airlock before she gets the Sphere’s information. Michael was put in a very difficult position—which worked despite Michael and Airiam not really having much of a relationship before this episode – but it was Nhan who took charge of the situation and ejected Airiam into space, as she requested. The touching moment with Airiam dying, reliving her favourite memory of being fully human on a beach with her husband, before the picture broke up and the screen flashed to black and turned into the show’s end credits was brilliantly handled. I can’t remember a moment where a character on Star Trek has died and to have really felt the loss, and Star Trek: Nemesis (2002) killed fan-favourite Data! It’s remarkable “Project Daedalus” pulled this off, with a character we barely knew as a person, whose relationships with Tilly and Michael were almost entirely forged in brief flashbacks within this episode too. I guess it’s a testament to Michelle Paradise’s writing and performances that it was sold so well, making you feel genuine heartache and sadness that a promising character had just found her moment and place on the show… only to see it ended. Unless, of course, there’s a way to undo this, which wouldn’t be impossible considering Airiam’s half-robot and that Discovery could perhaps beam her aboard for emergency resuscitation? It might be unwise to reverse the impact of how this episode ended but, for the benefit of exploring Airiam more, I’d accept a miraculous return. While this episode did seem to answer more me things about the big picture mystery, I’m still a little unclear with aspects of what’s going on. I don’t understand why a logic extremist would be made a Starfleet Admiral, for instance. Or why Control needed to bring Discovery closer so it could access the Galactic Sphere’s files. If an enemy has infiltrated S31, can’t it get that data through legitimate means now? There was no suggestion the Sphere’s information was only contained in Discovery’s databanks and, indeed, it would be silly to think it hasn’t been disseminated to the Federation at large by now. The exact nature of the Red Angel and whatever took control of Airiam has yet to be explained, too, if they’re not the same thing, which is what I assumed. “Project Daedalus” is mentioned by Airiam at the episode’s end, and obviously it’s worth checking your Greek mythology for hints at where things might be headed. Daedalus built the famous Labyrinth where a half-man half-bull Minotaur dwelt, so is half-human half-robot Airiam filling that part in this story? It certainly feels like the characters are navigating a Labyrinth in terms of the mystery this season, too, and could the fact King Minos sent seven men and seven women for sacrifice to the Minotaur explain the seven symbols in space? Also, Daedalus was part of the other story about escaping a prison tower with his son Icarus, after building wings of feathers and wax, only for his son to fly too close to the sun and die when they melted. Overall, this was a definite highlight of the season and more proof that Star Trek: Discovery is finding its footing with each passing week. 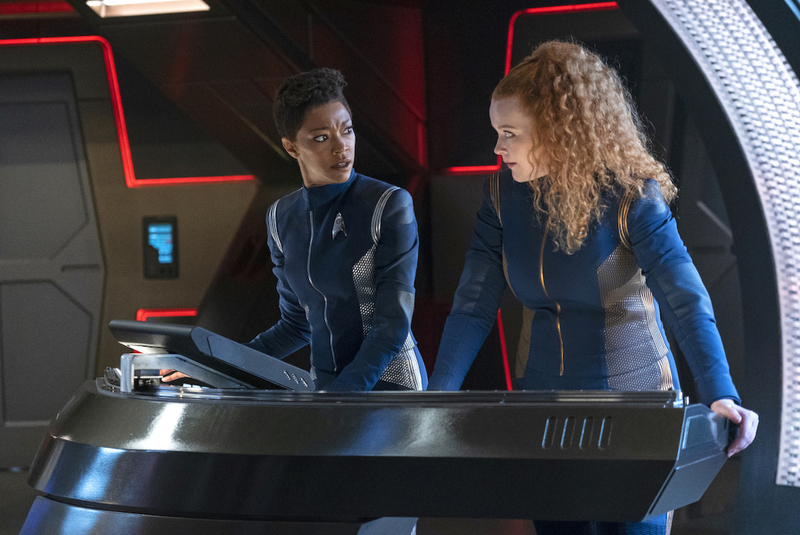 I enjoyed the first season, but this one has found a better balance with the things it wants to do and how it wants to approach being a modern Star Trek series. 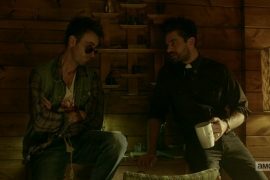 I’m also delighted to hear that this episode’s writer, Michelle Paradise, was recently announced as the co-showrunner of season 3. If she can turn Airiam into a memorable character you regret losing, in an hour, that bodes well for what she could achieve in creative control of an entire season. And as I started off saying, I hope more of the supporting characters, like helmsman Detmer (Emily Coutts), ops officer Owosekun (Oyin Oladejo), tactical officer Rhys (Patrick Kwok-Choon), and communications officer Bryce (Ronnie Rowe Jr.), will get their chance to shine next?